One of the benefits of shopping at TheaterSeatStore.com is that we give you exclusive access to brand-name home theater furniture you won't find anywhere else online. This includes a number of great InteriorMark theater seating options that are sure to enhance your movie or television viewing experience. Aspen. 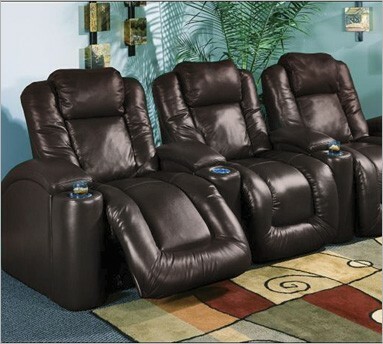 With features such as a motorized headrest, power recline, LED cupholders, and wrap-around bucket style comfort, the Aspen represents the very best theater seating InteriorMark has to offer. This model is available in luxurious black, brown, or merlot leather. Parker. The Parker comes with a chaise style footrest and motorized recline that stops and starts in any position. It also boasts a versatile design that complements virtually any décor. Essex. If you're looking for a terrific value in home theater furniture, check out the InteriorMark Essex model. The entry-level price tag and space-saving design allow you to purchase more units for smaller rooms, while the microfiber upholstery gives you the look of leather without the expense. All of our InteriorMark theater seating is in stock now and ready for immediate shipping as part of TheaterSeatStore.com's Quick Ship program. Visit us today for exclusive deals on these and other InteriorMark home theater furniture products so you can finally build the entertainment room of your dreams.